Winners of the 2016 Social Worker of the Year Awards at the Houses of Parliament. The winners of the Social Worker of the Year awards were yesterday treated to afternoon tea in the heart of government at the Houses of Parliament to mark the launch of the 2017 awards. 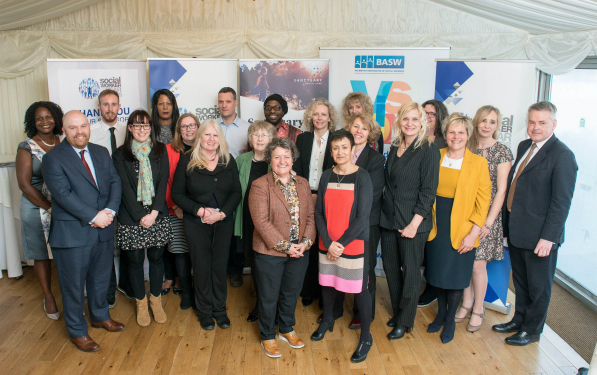 Hosted by MP and former minister for children’s services, Tim Loughton, it was a chance for the winners to chat and network with sector leaders including the two chief social workers, Isabelle Trowler and Lyn Romeo, and the shadow minister for children’s services Emma Lewell-Buck. Children’s minister Edward Timpson was unable to make the event. The event marked the launch of the 2017 awards which will open for entries on Tuesday 28th March and the closing date for nominations is Friday 21st July. In total there are 17 different categories across both children’s and adult services. See the website for further details on how to enter and to download an entry form. Community Care is the official media partner for the awards. Social worker salaries: are permanent staff now better off than agency? Seven steps towards a more anti-oppressive social work approach to care proceedings BASW attacks media after death threats against social workers named in articles Do social workers risk a criminal offense by repeatedly viewing service users’ social media?